If you have limited space at home, you need to make certain adjustments that would work out for your situation. Instead of buying bulky appliances that would take up too much space, you can settle for smaller ones which can also get the same job done. One good example is a countertop oven. It is a great cooking appliance which can cook the same type of food as a conventional oven but will occupy a smaller space. Many people are now choosing countertop ovens because of its size. As the name implies, you can put it anywhere on your counter since it does not require you to connect it to a gas line. You just need electricity to make it work. A good countertop oven saves energy. Since countertop ovens are smaller than the traditional ones, there is lesser space so it requires lesser heat as well. This means that you use less electricity than you would to cook the same food in a traditional and regular sized oven. To give you a better idea, here are some interesting things that you can do with a countertop oven. Use the toaster oven to reheat leftovers. Most people use the microwave when reheating leftovers, but the food usually ends up soggy and sometimes, inedible. If you use a toaster oven, the food will retain both the texture and flavor so you can enjoy it again like it was freshly made. Use it to roast meat and vegetables. This is especially applicable if you are only cooking for yourself or even for two. You can use the toaster oven to roast any type of meat and vegetables to create a healthy meal. Just season everything with your favorite seasonings and let the toaster do all the work. Bake cookies, cakes, muffins, and quick breads in it. If you want to bake just a small amount, you can use a toaster oven instead of a big oven to save energy. You can easily bake mini cakes, a few cookies, or even a small loaf of bread. Use the toaster oven to make perfectly golden biscuits. In fact, this appliance can help you make quick and delicious biscuits without making them hard or dry. Make a homemade pizza for yourself or for a small group. If you have a bigger toaster oven, you can bake up to a 12 inch pizza in it, but if you have a small one, you can still use it to bake pizza by using English muffins or bagels as your crust. Cook bacon easier in a toaster oven. You will find that cooking bacon in the oven is so much easier than frying it on a stove. The good thing is, you can avoid the splashing hot grease from the sizzling pan. Roast some nuts in it. All you have to do is toss the nuts and arrange them on a baking sheet. Put some oil and season them with salt or anything that you like and then leave in the oven for about 20 minutes. They are very easy to make and great for snacking. Make baked potatoes. Place washed and scrubbed potatoes on the oven tray and poke holes in both sides using a fork. Bake for approximately an hour at 400 degrees. Once done, you can top it with melted cheese and bacon that you also cooked in the oven. Make croutons for your salads and soups. Just toss small cubes of bread on the tray and put some olive oil and seasoning. Arrange them in a single layer and toast until they become crunchy. Dehydrate fruits and vegetables. Make sure that your toaster is set to its lowest setting if you intend to use it to dehydrate. Simply put slices of your preferred fruits and vegetables on a baking sheet and cook in the oven for a few hours, until they are completely dehydrated. There are also some countertop ovens which have a hot plate electric cooker on top that can be used to reheat your dish. With this function, you can save a lot of time cooking and reheating your food. Countertop ovens cost less than conventional ovens. Takes up less kitchen space. Fit anywhere and is ideal for people living alone or students living in an accommodation but would like to cook their own food. Easy to clean because of its compact size and easy to remove racks and trays. Versatile because it allows cooking food in small batches, but also enables you to cook larger amounts. Contains heat, so it will not raise too much temperature in the kitchen. Many heating options. 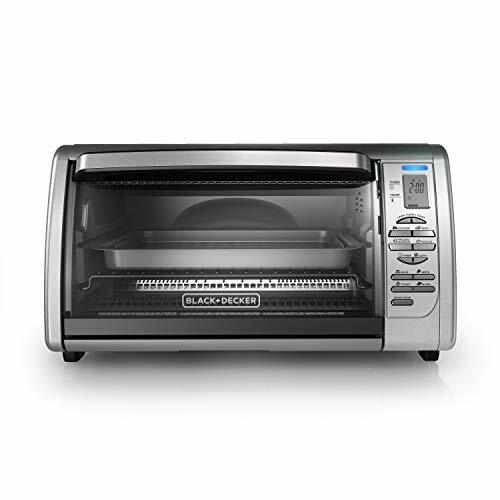 You can use your countertop oven for toasting, roasting, baking, and convection cooking. If you are shopping for a countertop oven, there are some factors that you need to consider. Some of these factors include energy efficiency, space, rotisserie setting, cleaning, and the price of the oven. Make sure that you check the unit of energy and the heat efficiency units when choosing the best countertop oven. You should choose something that is able to run a small wattage compared to conventional ovens that are built-in or can stand alone. To save energy and lessen the cooking time the oven should also be able to give high temperatures. The very essence of buying a countertop oven is to maximize the space that you have in your small kitchen. You should know the measurement of the available space that you have on your countertop where you intend to place your oven. Then, measure the dimensions of the oven that you want. Make sure that you choose the one that will fit on your countertop, otherwise, it defeats the purpose. This is one of the important features that you should look for in a countertop oven. Look for one which can hold a large, or at least a medium sized pizza. Also, check the number of racks and ensure that your cookware and bakeware will fit in the oven perfectly. It would be better if the oven has adjustable racks so that it can be more flexible in terms of using different cookware. Of course, cleaning the oven is an important factor, so choose one which is easy to clean. The insides should be easily accessible and it would even be better if the racks and other parts are removable. It would also help if the oven includes a crumb tray so that you can just remove it to get rid of small food particles and crumbs that fell during cooking. Most of the time, high quality ovens cost more because of the brand name or additional features. However, you do not have to spend a lot just to get a good countertop oven. Different models have varying prices so you just have to check which models have the features that you are looking for. Better yet, set a budget so that you can narrow down your choices and just work within the amount that you have in mind. This may not be a priority for some, but if you are particular with how your kitchen looks, then you might want to look for an oven which will fit into the overall style of your kitchen. For instance, if most of your kitchen appliances come in chrome, it would be best to look for a chrome oven too. A great countertop oven can enable you to do a lot of your masterpieces in the kitchen. It can be your only tool to come up with great dishes that you can share with your family. That is why once you have found the perfect oven for your home, make sure that keep it well-maintained for it to last for many years. One way of maintaining your oven is to clean cooking surfaces and attachments after each use. Inspect dishes and cookware before use to ensure that there will be no drips and spills that will be left in the oven. If left uncleaned, drips and spills will result in burning and scorched food smells the next time that you use the oven. So, to avoid ruined meals and to ensure that your oven can serve your cooking needs for a long time, proper maintenance is the key. If you’re interested in buying a countertop oven, here are ten favorites that we recommend. 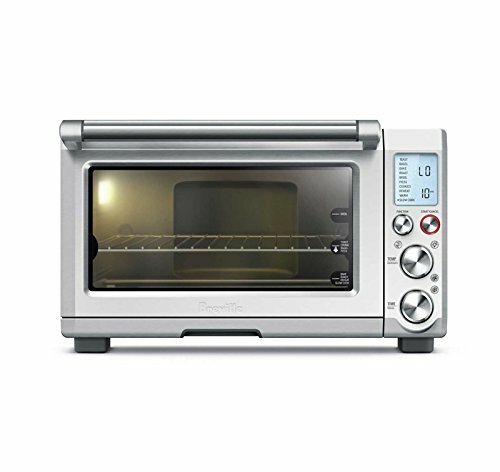 This Breville 1800-watt toaster oven is made of stainless steel. It has a slow-cook function for longer cooking at a lower temperature. The Element IQ automatically adjusts the heating to cook for you. It has 10 menu functions as well. The exterior dimensions are 18.5” W x 15.5” D x 11” H, and the interior measures 13.25” W x 11.25” D x 5.25” H (0.8 cubic feet), with a weight of 22 lbs. 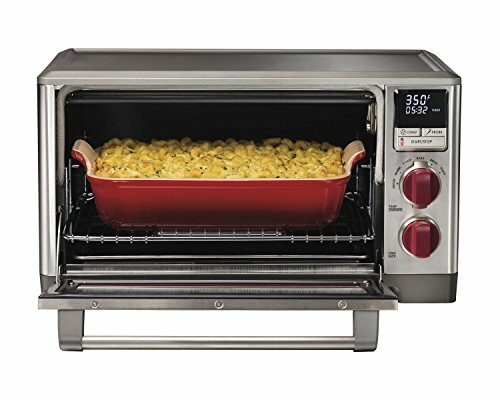 With two racks in this Hamilton Beach countertop oven, you can fit two 12” pizzas, two 9” x 13” casserole pans or two cake pans. It has a revolving rotisserie that can fit a 5-lb. chicken. It also has bake and broil settings, with both timer and temperature dials. It’s black with stainless steel accents. The internal measurements are 14.25” W x 13.25” D x 10.25” H, and the outside is 16.5” W x 20.6” D x 13.1” H.
This stainless steel Oster countertop oven has an extra-large capacity to fit a 16” pizza, an easy clean interior, and can heat up to 450°. 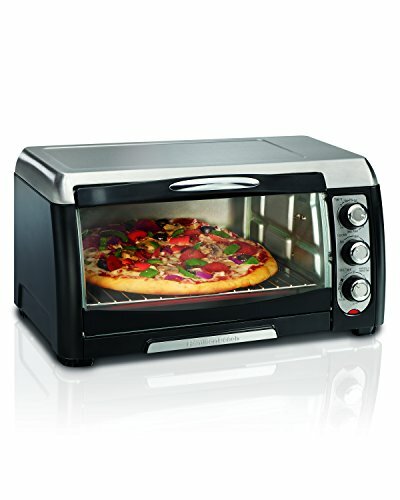 It has bake, toast, pizza, and defrost settings, and includes two oven racks, a bake pan, and a broil rack. 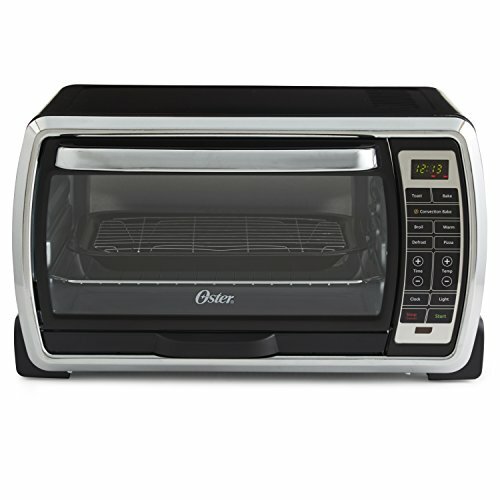 The outside measurements are 21.65” W x 12.91” H x 19.2” D, and the inside is 15.75” W x 16.36” D.
This Black & Decker toaster oven uses convection heating to quickly bake, broil, or toast your food. It’s made of stainless steel, and it comes with two racks (toasting and broiling), and a bake pan. You can fit a 12” pizza or six slices of toast. It’s 22.8” x 13.4” x 15.5” on the outside and 13.5” W x 10” D and 5.5” H on the inside. An integrated temperature probe is perfect for meat lovers cooking with this Wolf Gourmet countertop oven. There are six cooking modes—bake, broil, roast, proof (bread rising), toast, and warm. It can fit a 9” x 13” casserole dish. Comes with a dishwasher-safe baking pan and broiling rack. 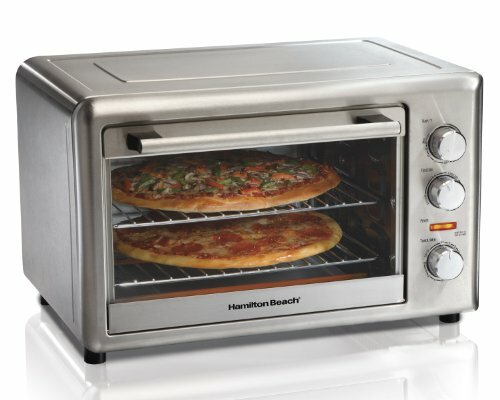 It’s 22.5” x 22” x 12.5” on the outside and the inside is 16” W x 12.25” H.
With two racks in this Hamilton Beach countertop oven, you can fit two 12” pizzas, two 9” x 13” casserole pans or two cake pans. 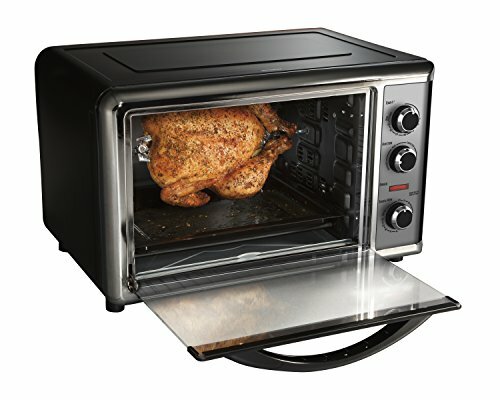 It has a revolving rotisserie that can fit a 5-lb. chicken. It also has bake and broil settings, with both timer and temperature dials. It’s entirely made of stainless steel. The internal measurements are 14.25” W x 13.25” D x 10.25” H, and the outside is 16.5” W x 20.6” D x 13.1” H. It’s the same model as the Hamilton Beach model above, just in a different color. You get 0.8 cubic feet of cooking capacity and an internal light in this DeLonghi countertop oven. It uses convection heating, and can bake, roast, broil/grill, defrost, or toast. It’s got settings for fresh cookies, frozen cookies, three types of pizza, and roast chicken. It comes with two wire racks, a bake tray, a crumb tray, and a pizza pan. The outside dimensions are 19” x 17.5” x 12”, and it weighs 24.9 lbs. 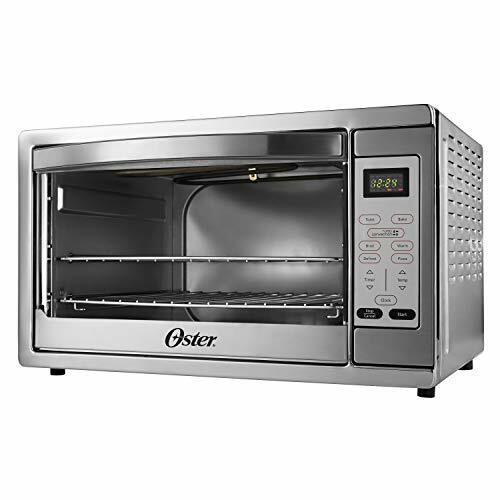 With the capacity to hold six toast slices, a 9” x 13” pan, a whole chicken, or a ham, this is a large Oster countertop oven. The sides are curved to allow more room, and it has digital controls with an interior light. The dimensions are 15” x 19.8” x 11.4”, while inside it’s 14” W x 8.5” H x 12” D.
Of the three Hamilton Beach ovens on this list, this is the least expensive. It’s black with silver trim and has an extra-large capacity to fit a rotisserie, two 12” pizzas, or two 9” x 13” casseroles. 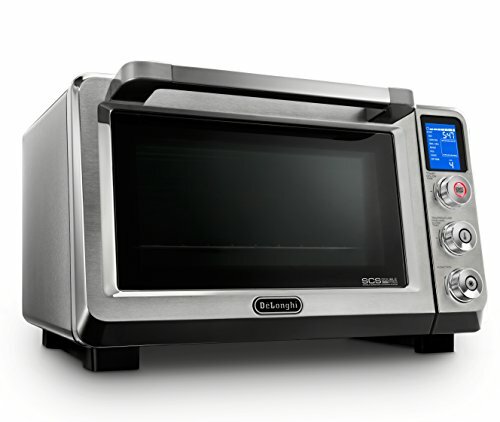 It uses convection heat and has bake, broil, rotisserie, broil, and toast settings. The outside dimensions are 23.1” x 17.8” x 14.6” in size. 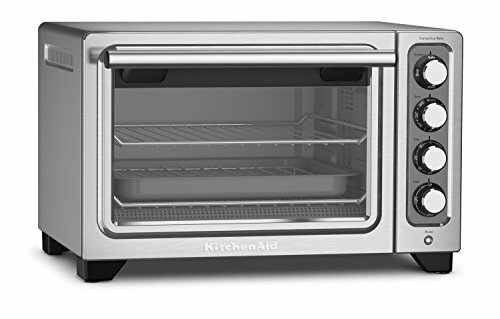 This KitchenAid countertop oven is black with silver accents. It bakes, broils, toasts, warms, and uses convection heating. It has function, temperature, time, and toast dials. The outer dimension measurements are 15.3” x 20” x 11.3”, and it weighs 19 lbs. Next10 of the Best Drip Coffee Makers Reviewed for Coffee Lovers!